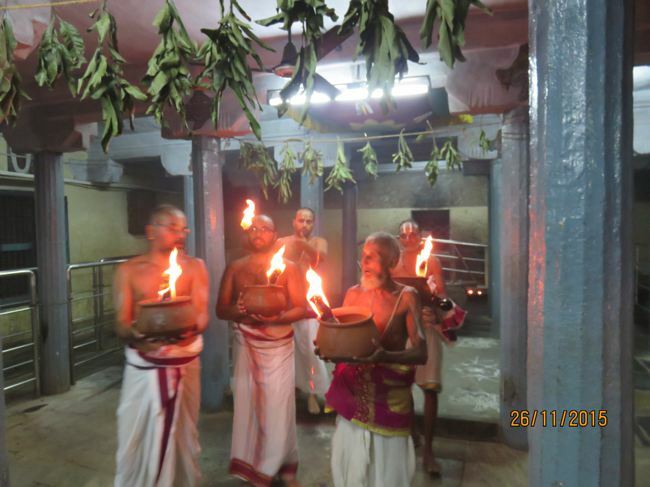 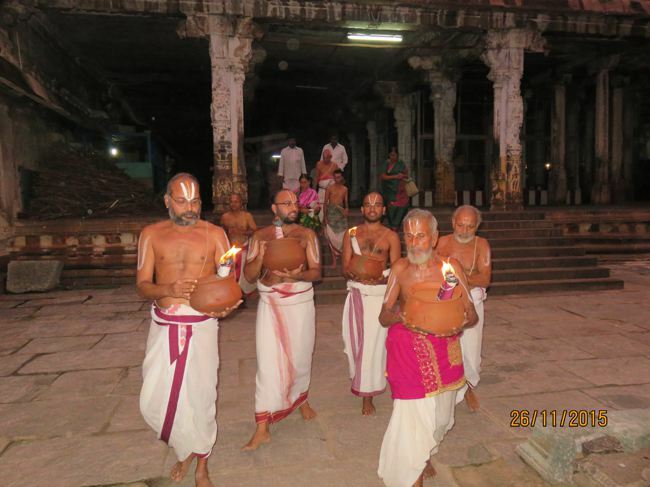 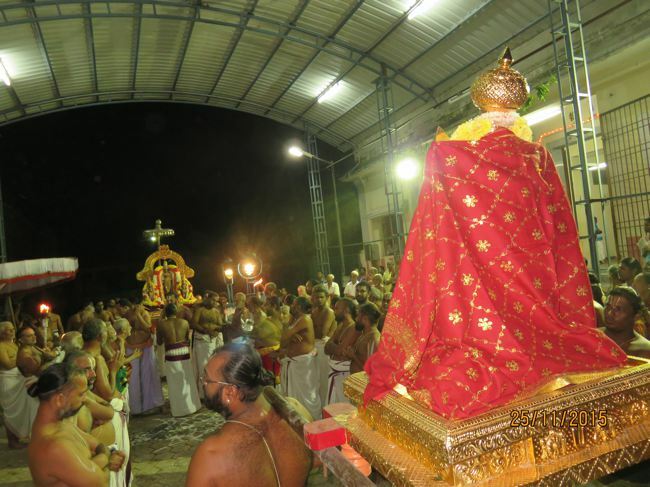 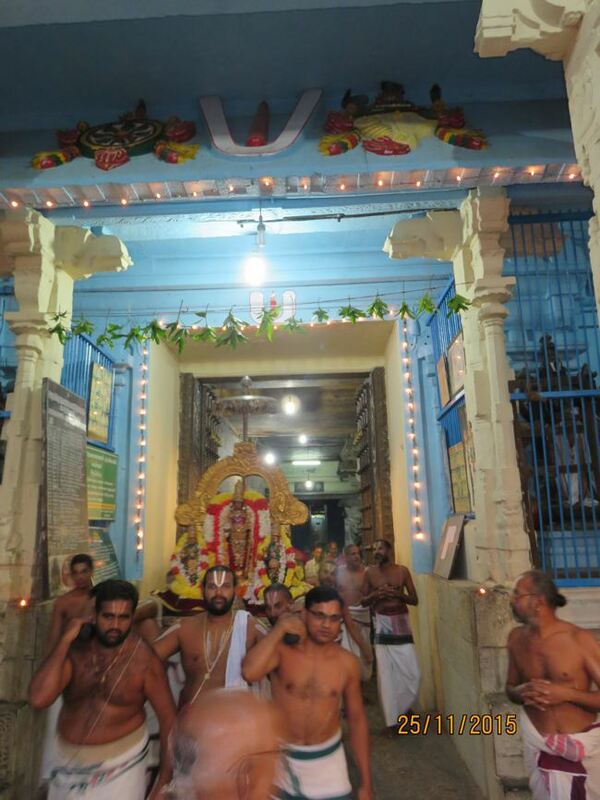 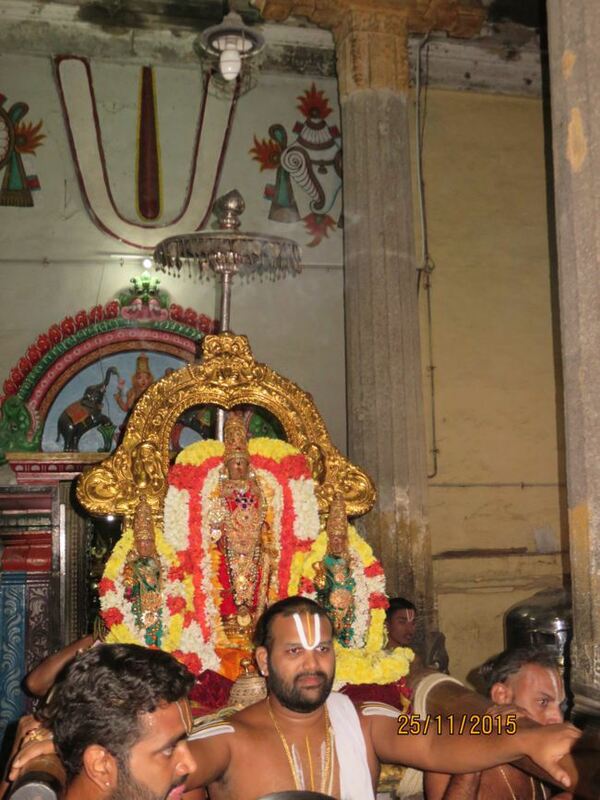 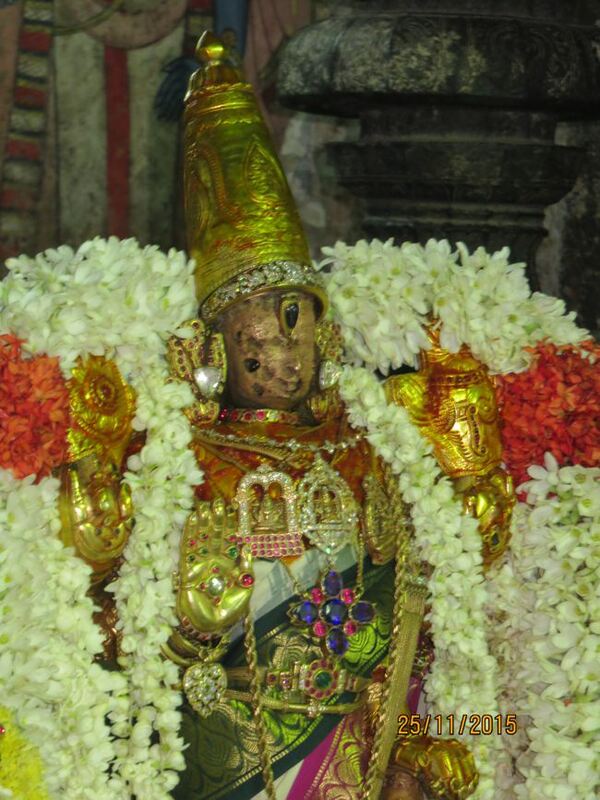 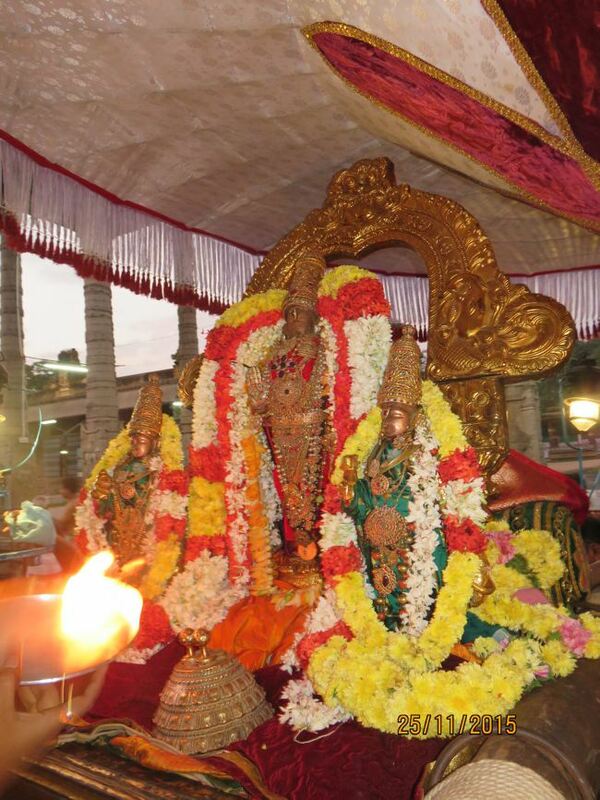 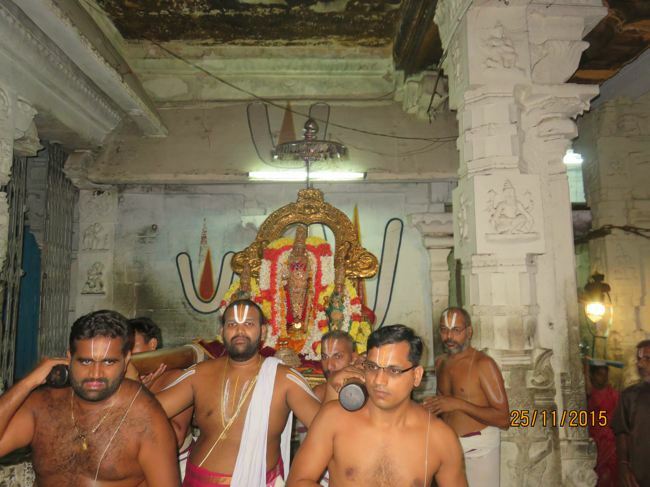 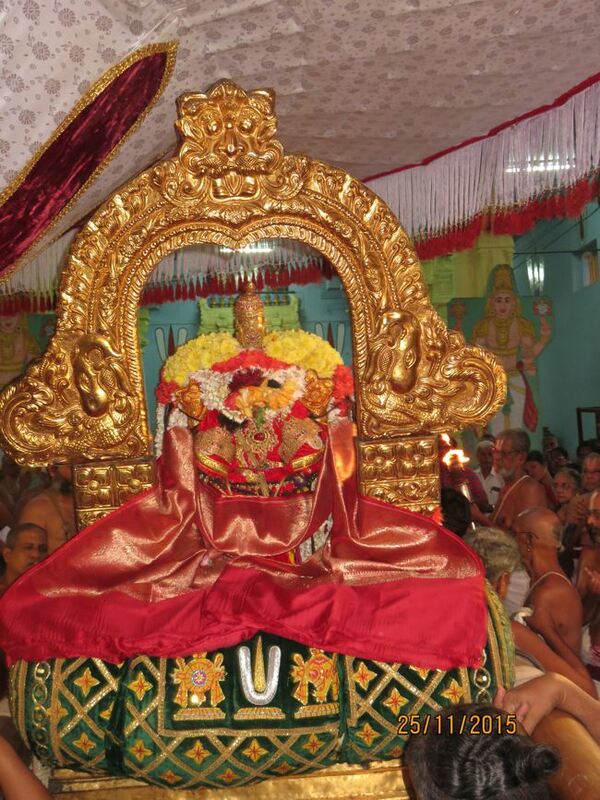 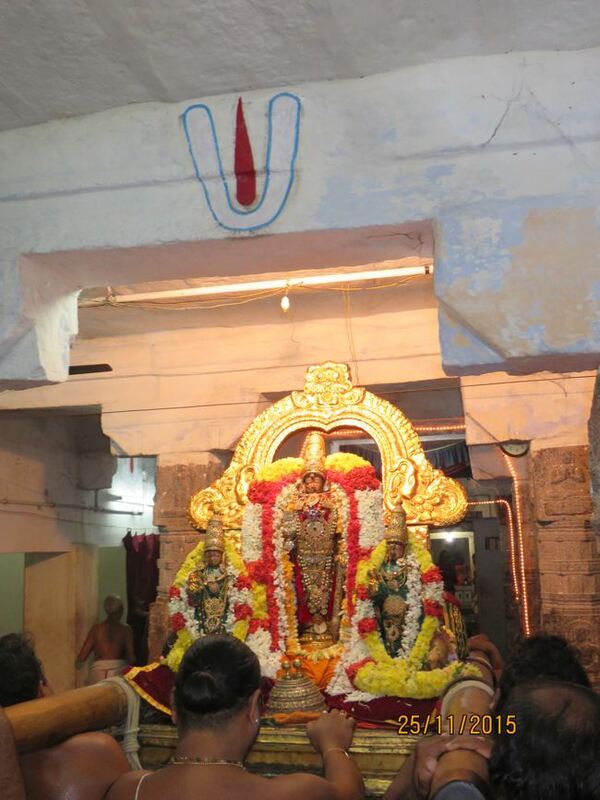 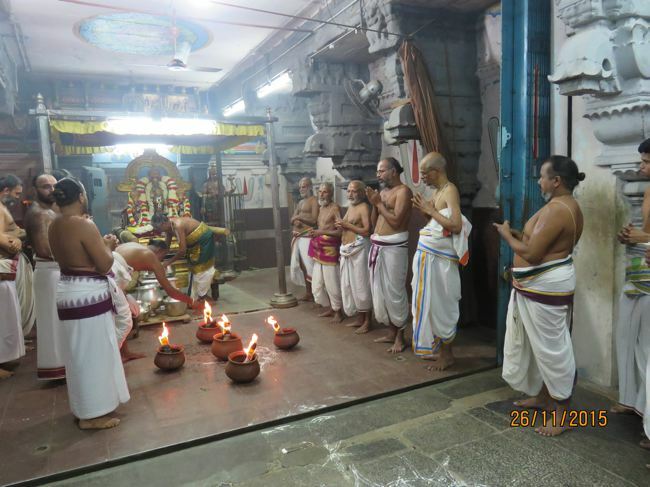 On November 26th Pancharatra Deepam(Tirukarthigai) was celebrated grandly at Kanchi Sri Varadaraja Perumal temple. 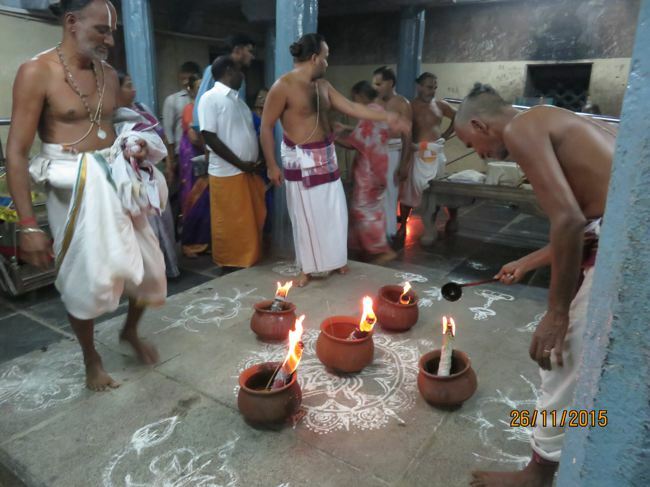 November 25th Bharani Deepam and Tirumangaiazhwar tirunakshatram was celebrated. 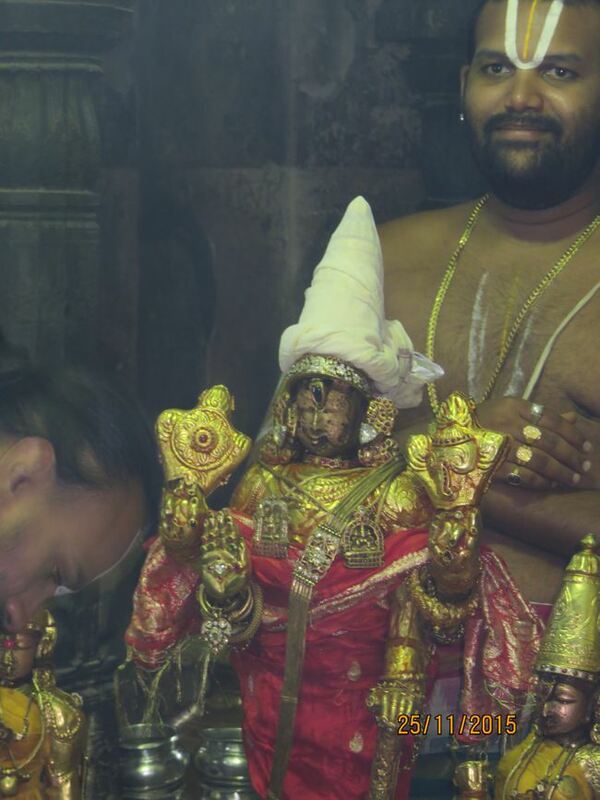 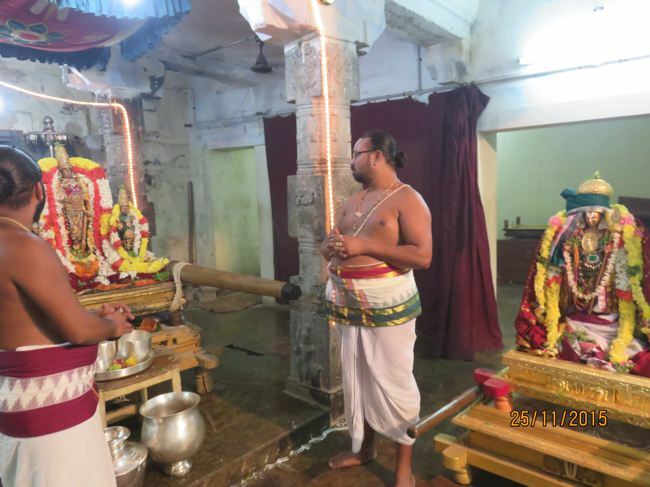 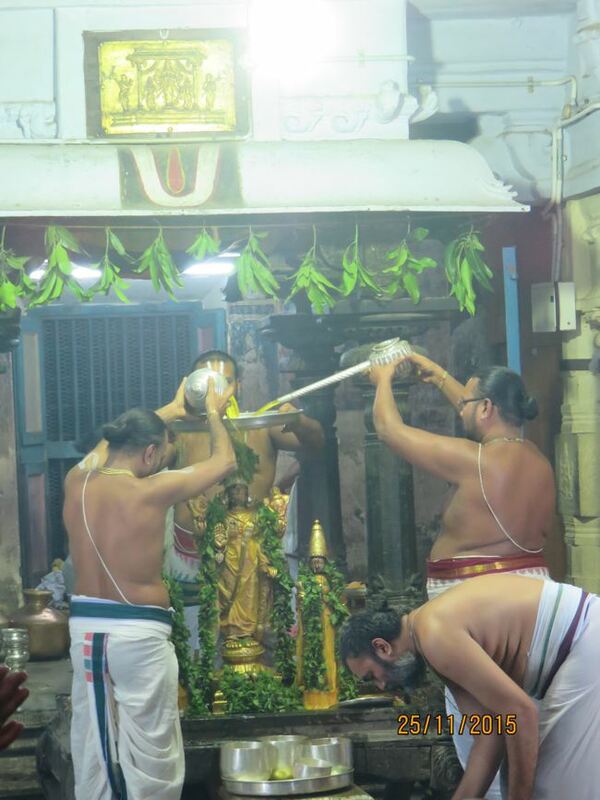 Varadan and His ubhayanachimars came in purappadu and after stopping first at Swami Desikan sannidhi as is usual went uptil Tiruvadi koil on sannidhi street to bless Hanuman before returning back to the temple. 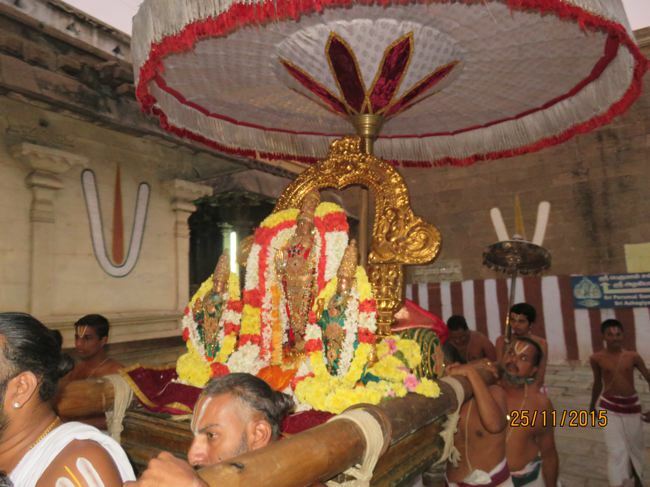 The procession then moved along to bless Tirumangaiazhwar on his tirunakshatram(Karthigai Krithikkai) housed in SriRamanuja sannidhi. 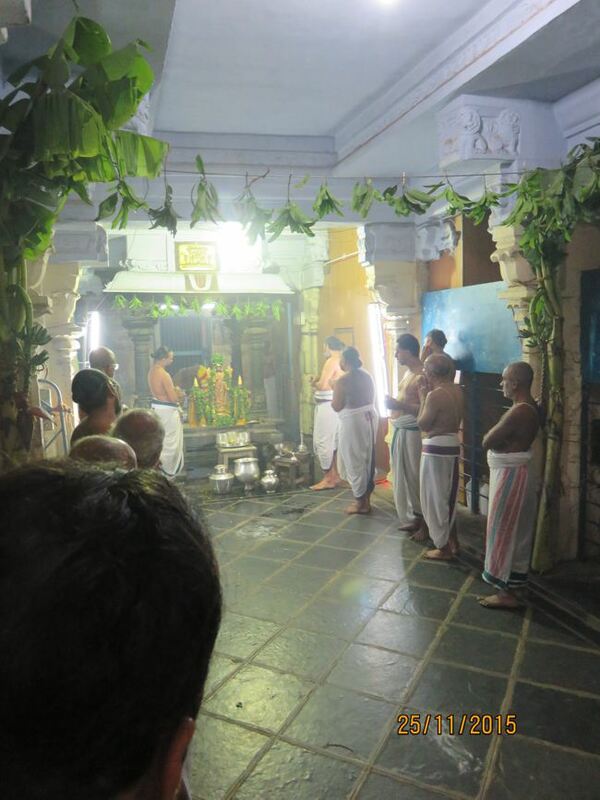 Goshti took place here followed by Prabhandanushtanam. 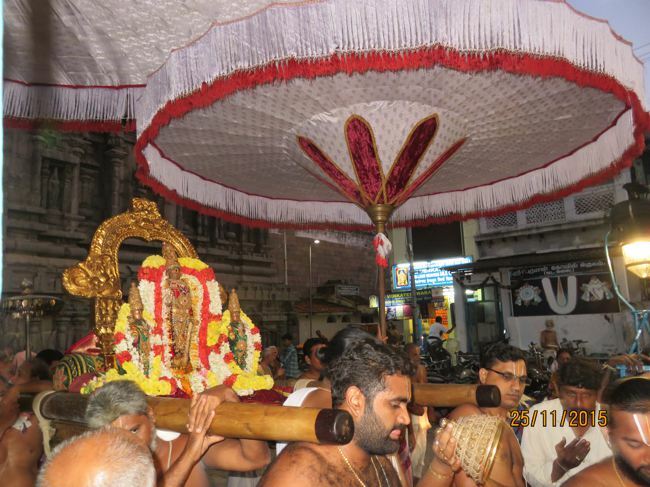 Later on there was Tirumanjanam to Perumal on Hasthigiri. 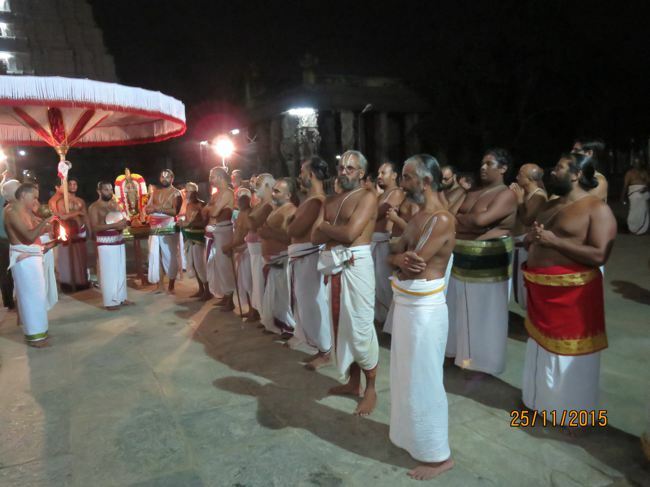 On November 26th, lamps lit at swami Desikan sannidhi are taken to Varadaraja Perumal sannidhi on the Hasthigiri hillock. 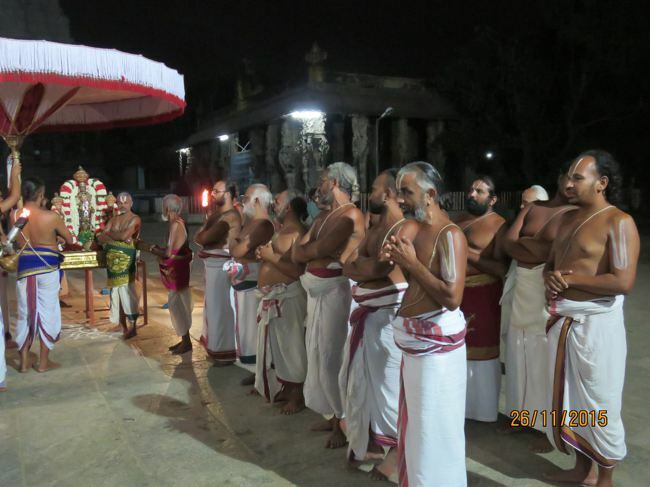 At kanadi-arai after aradhanam at about 6.30p.m. 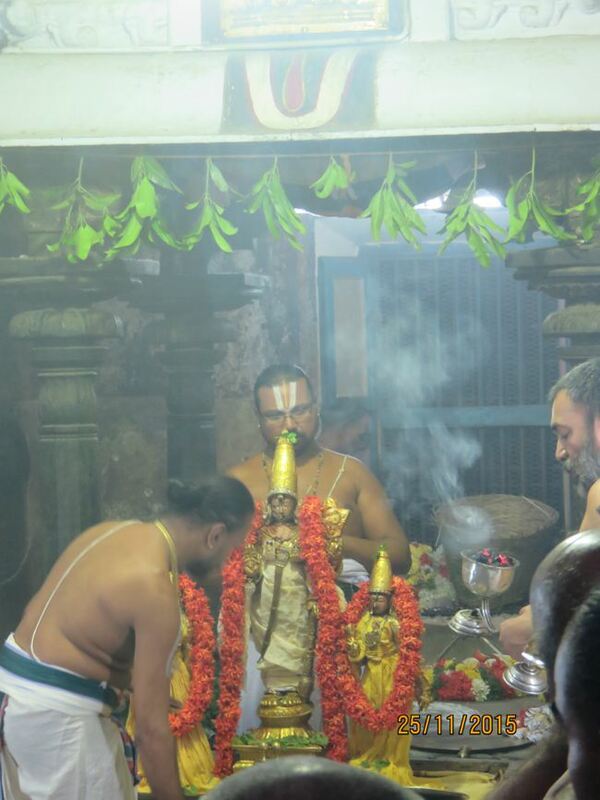 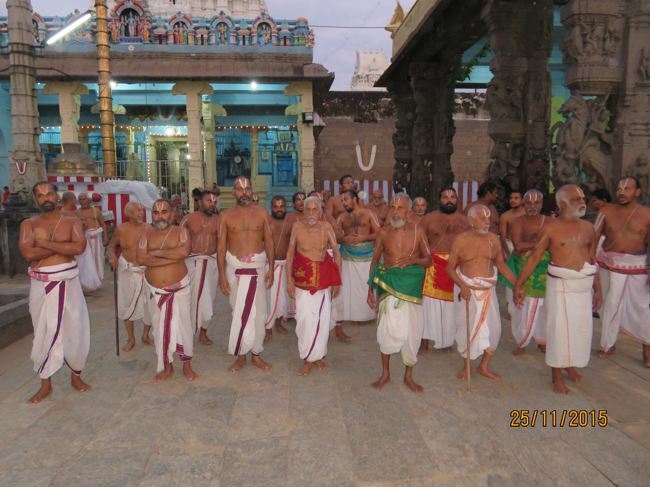 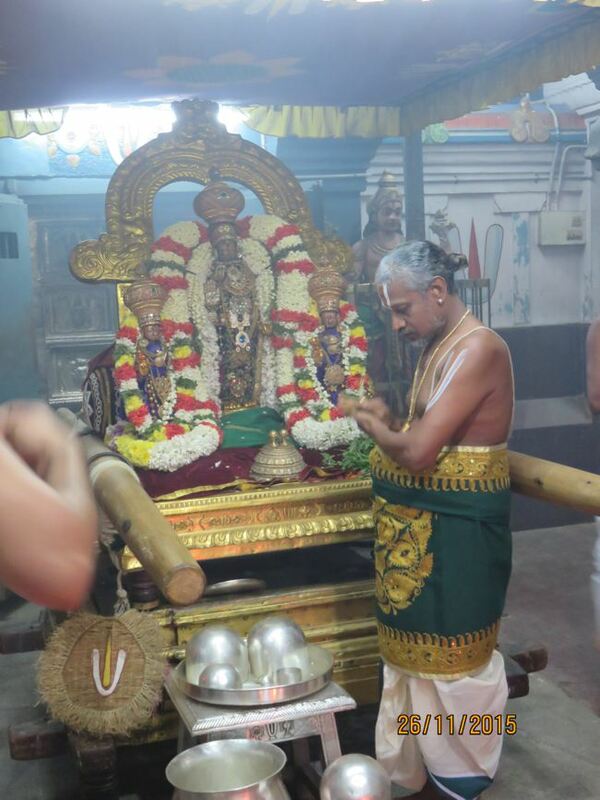 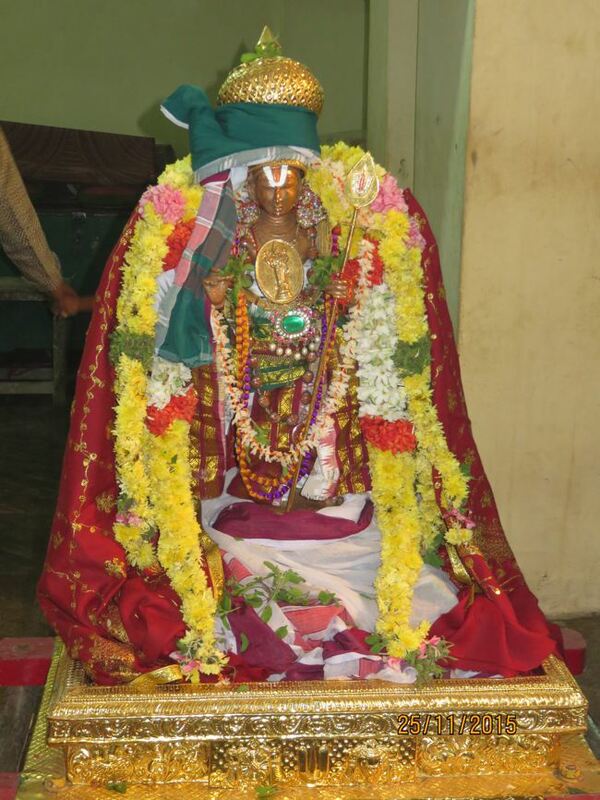 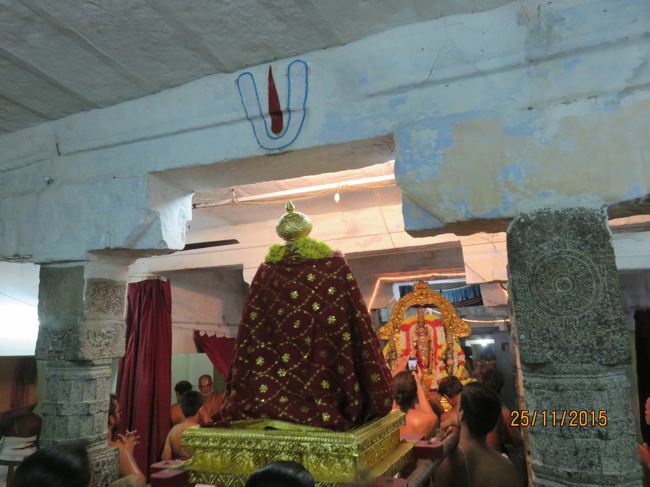 Perumal along with ubhayanachimars started in purappadu and waited at the temple entrance to witness sokkapanai. 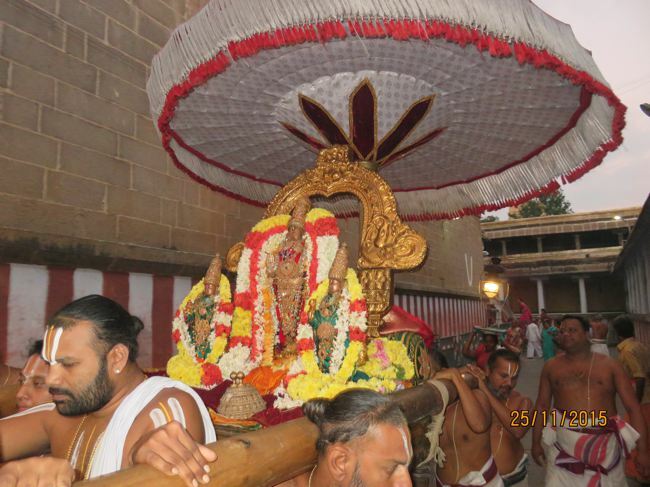 Sokka panai is a kind of tent like structure made with dry palm leaves and stuffed with fireworks and crackers. 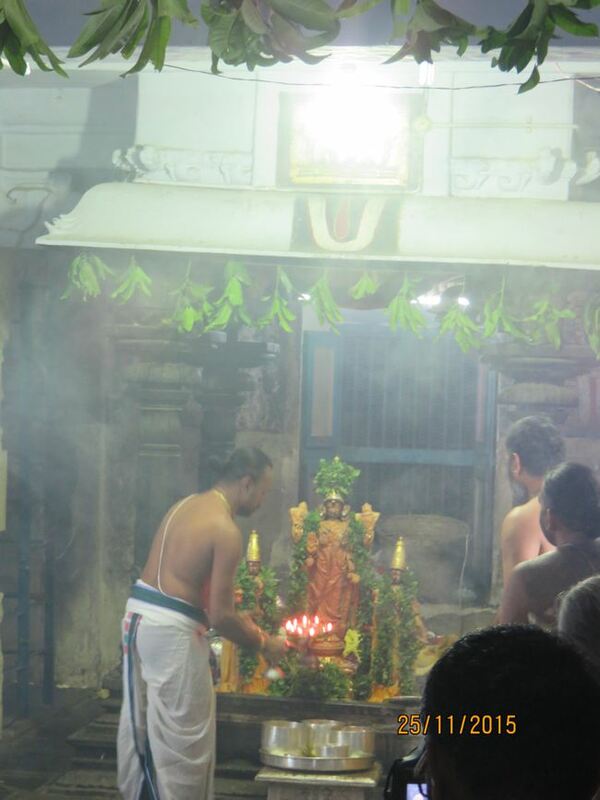 As soon as it is lit the flame rises up and symbolises Trivikramavathara of Perumal. 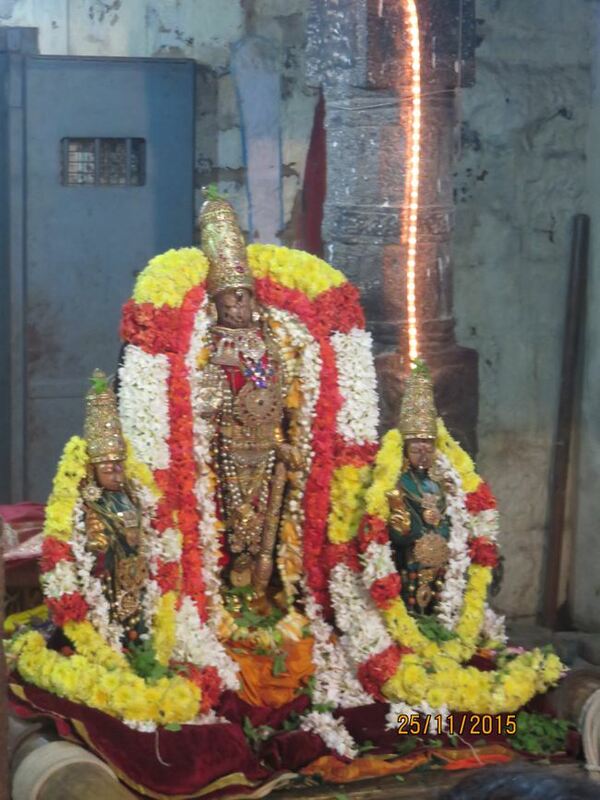 At Varadaraja Perumal temple it is lit infront of the dwajhasthambam. 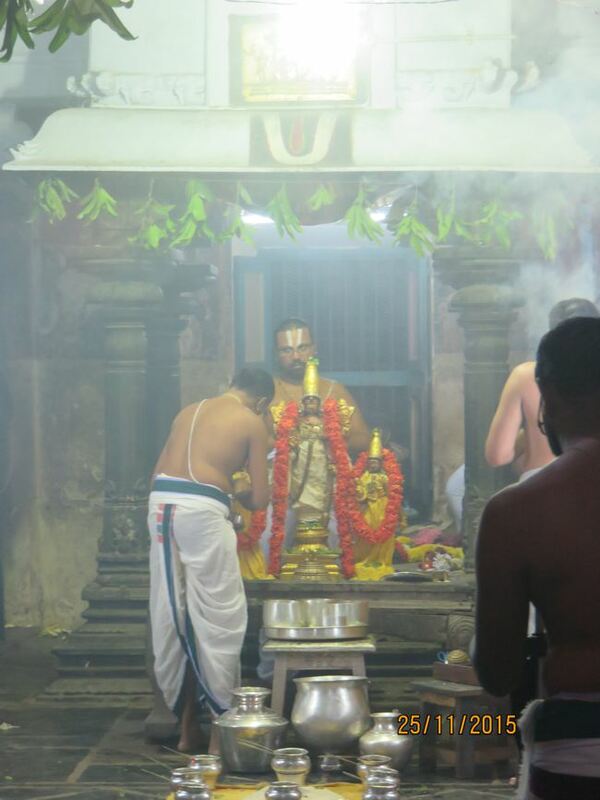 Once the flames subsided Perumal moved to swami Desikan sannidhi to bless the foremost of acharyas. 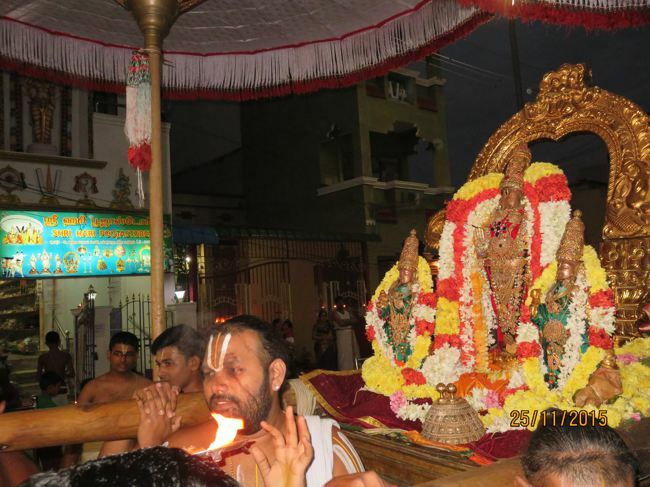 Then He moved on Sannidhi Street and Mada Streets to bless devotees at their doorstep. 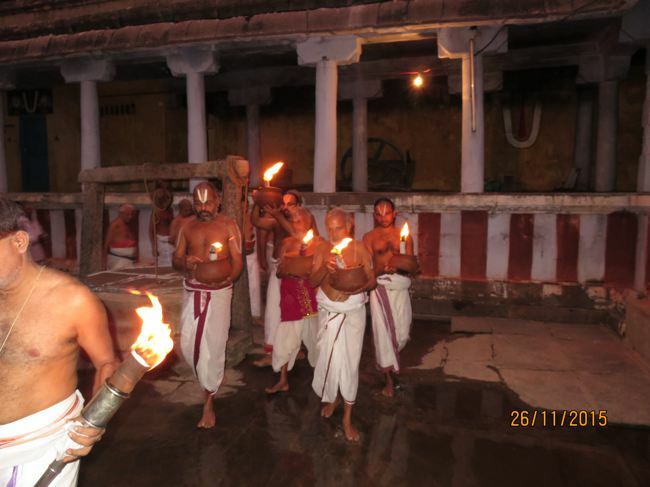 The houses were beautifully lit with oil lamps to welcome the King of the Universe. 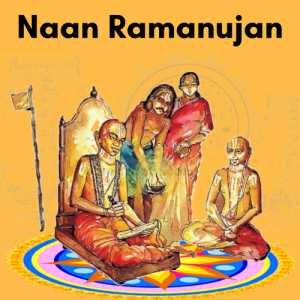 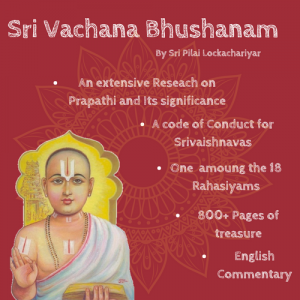 Blessed were those present in Kanchi to make their offerings of patram, pushpam to Varadan who is Saulabhyam Personified. 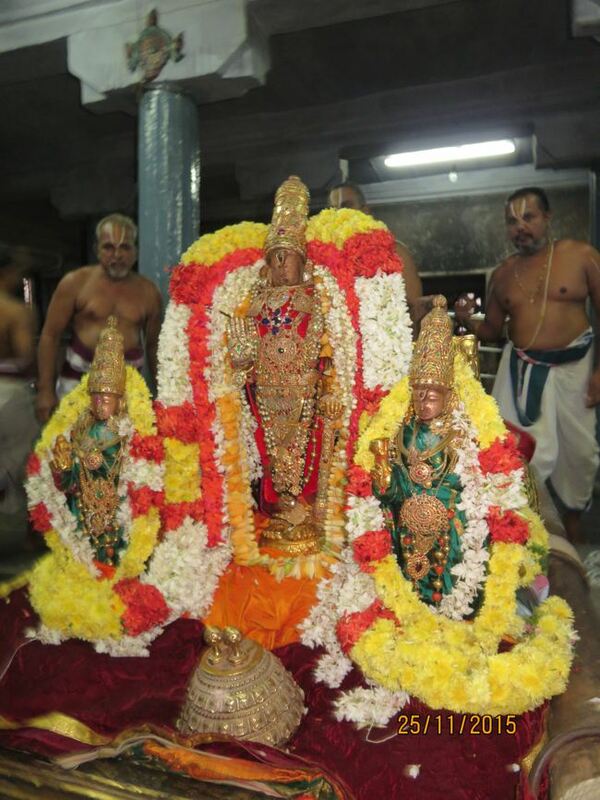 After going to bless Tiruppanazhwar Perumal, it being his tirunakshatram(Karthigai Rohini) Perumal and His Consorts returned to Atthigiri. 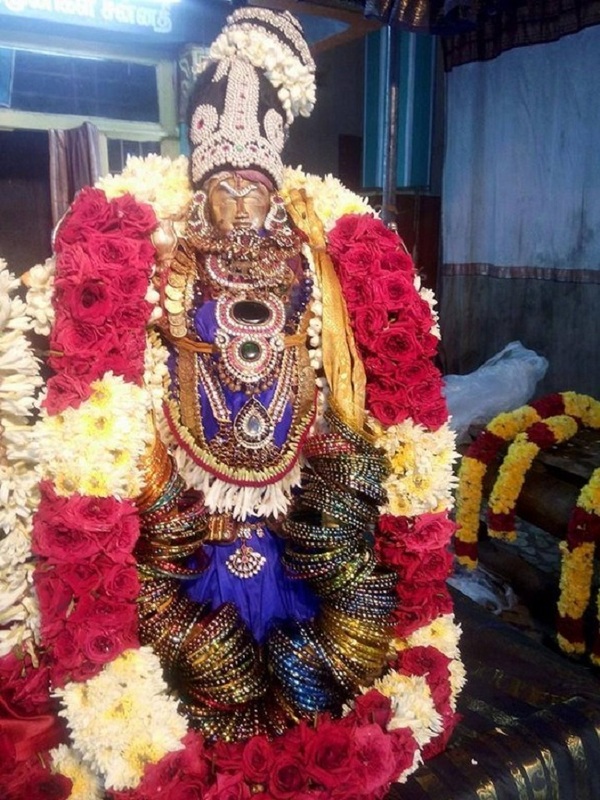 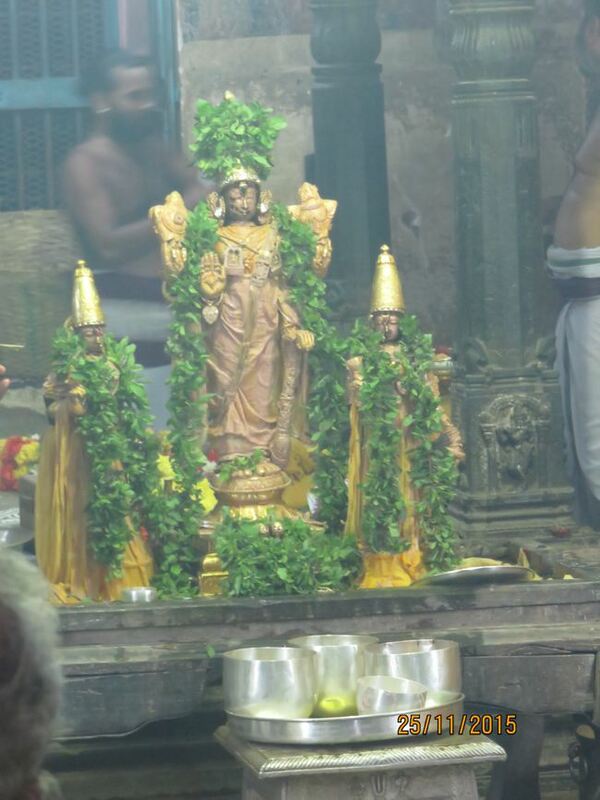 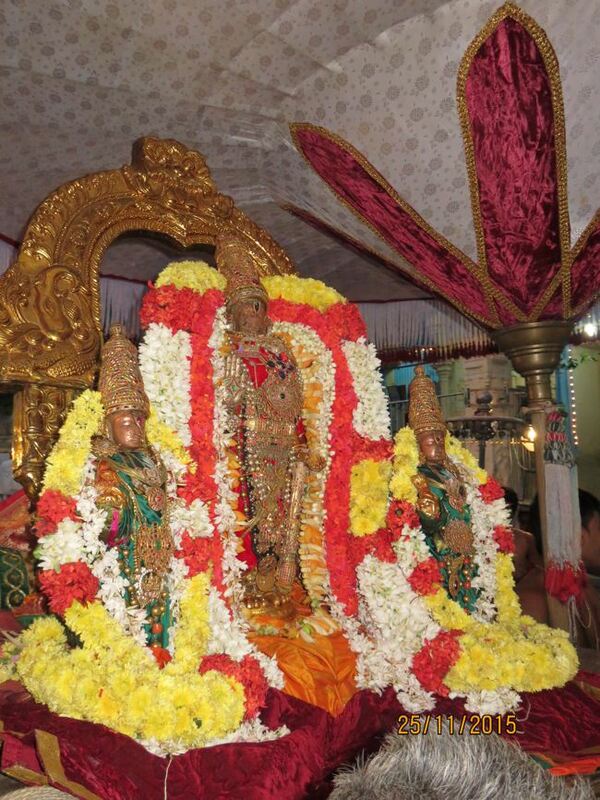 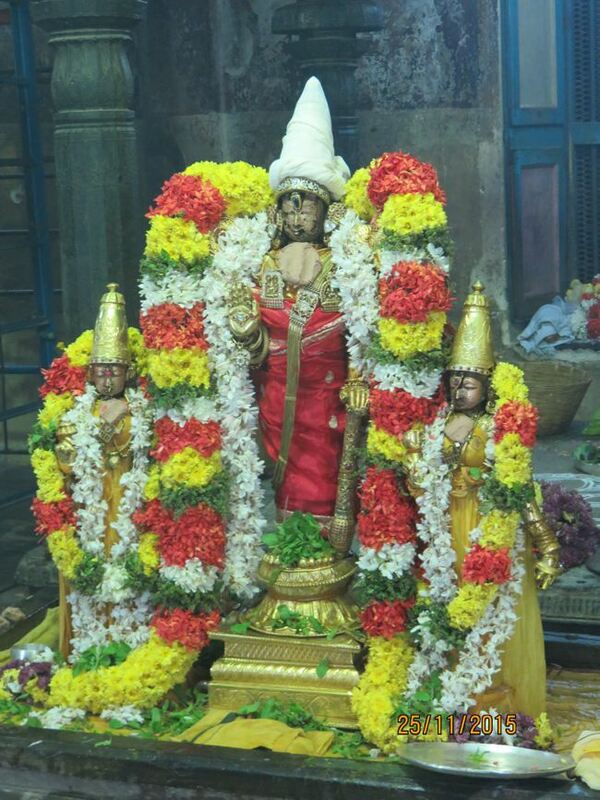 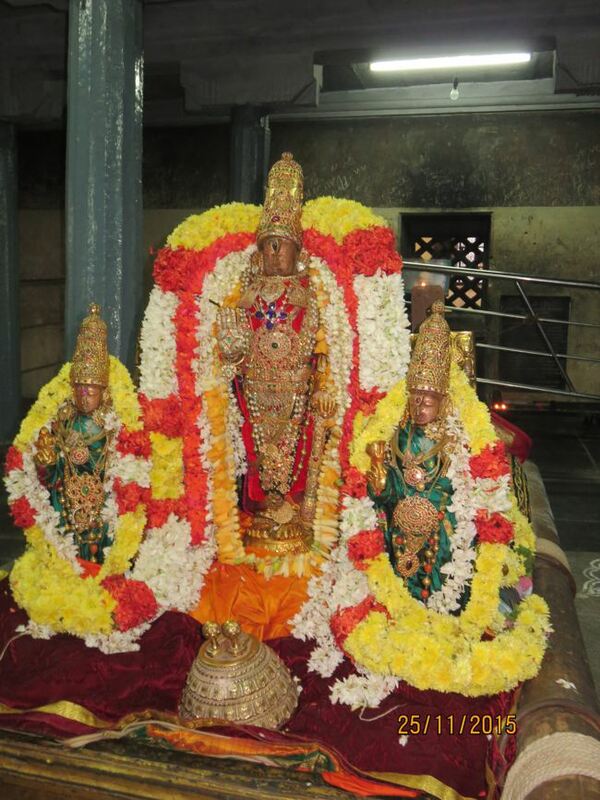 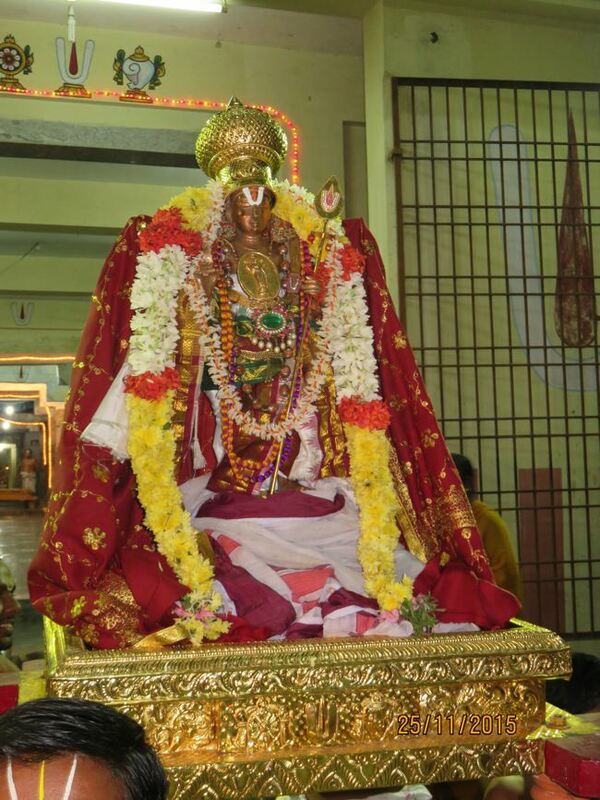 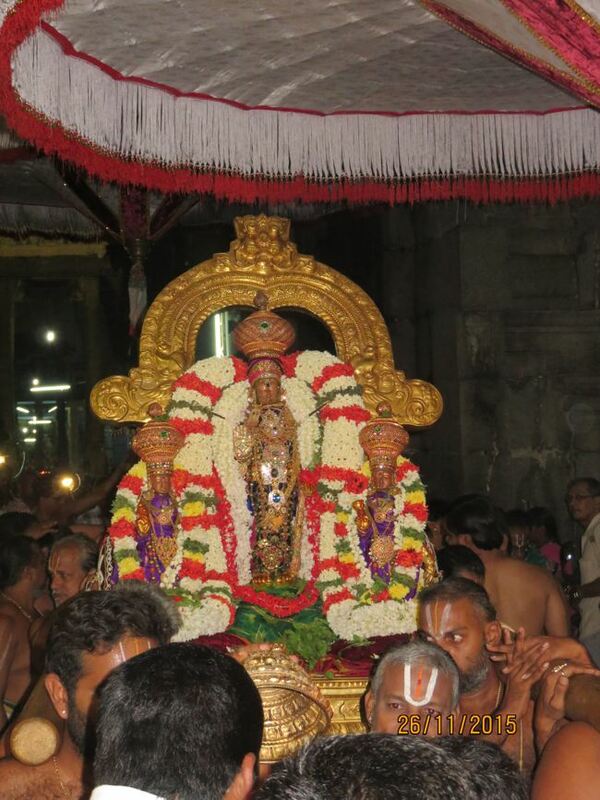 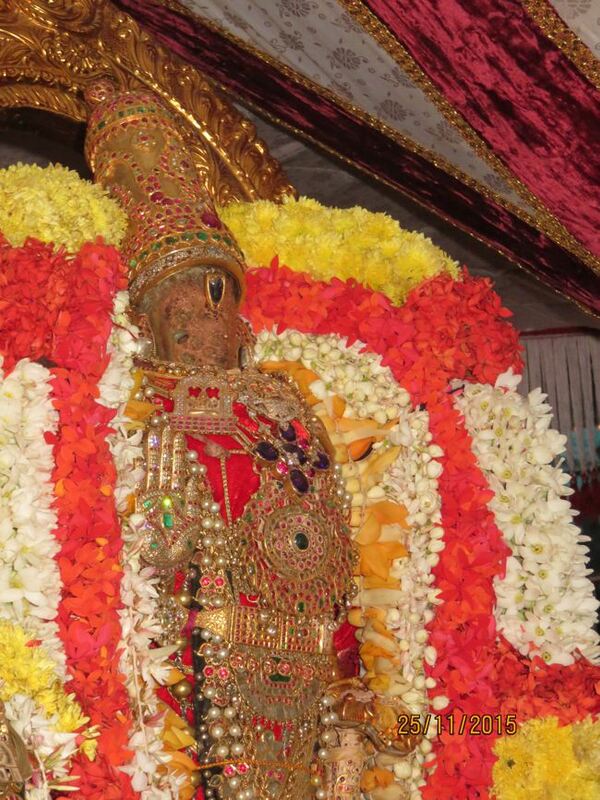 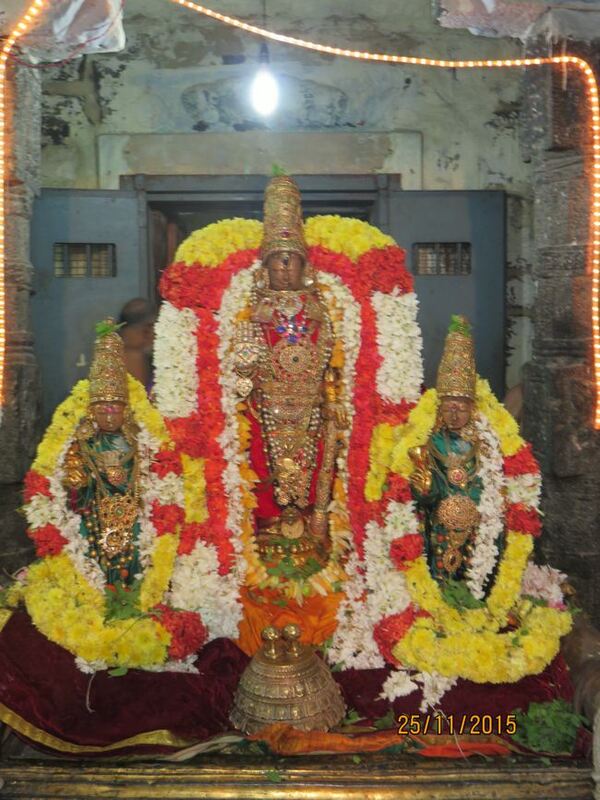 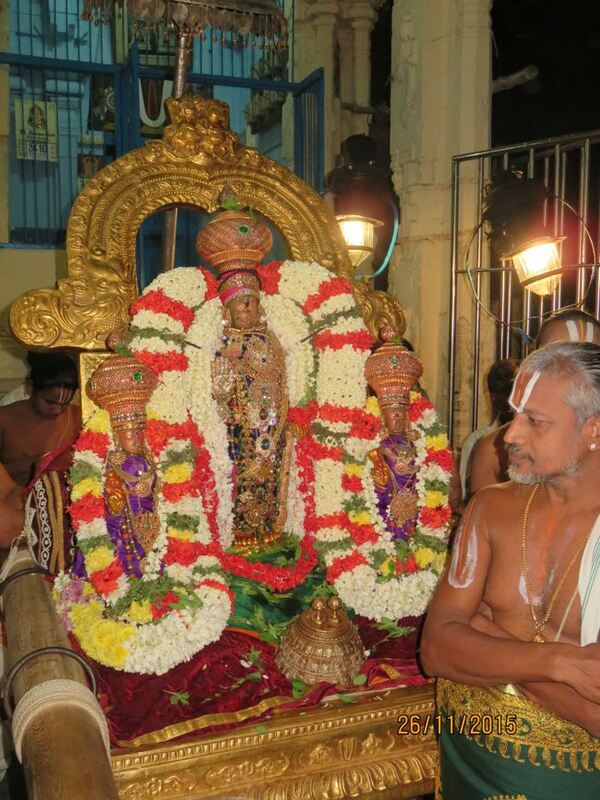 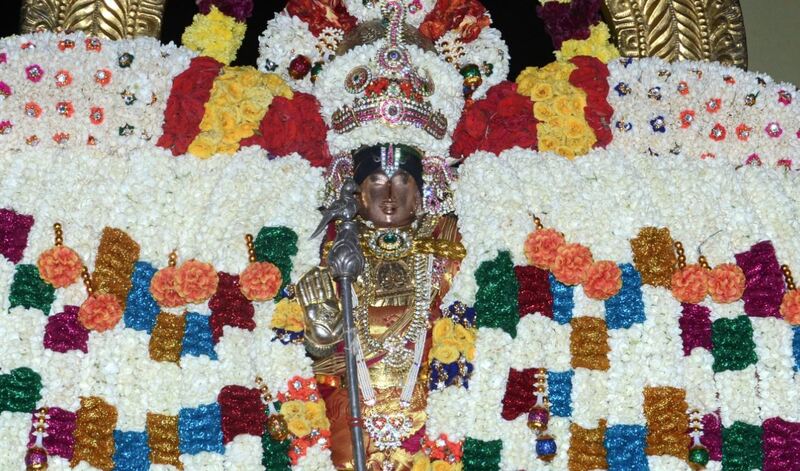 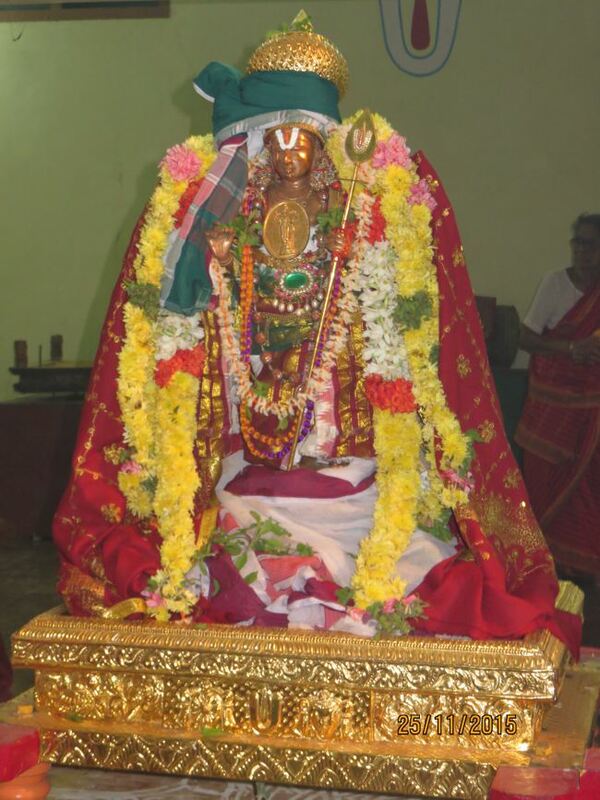 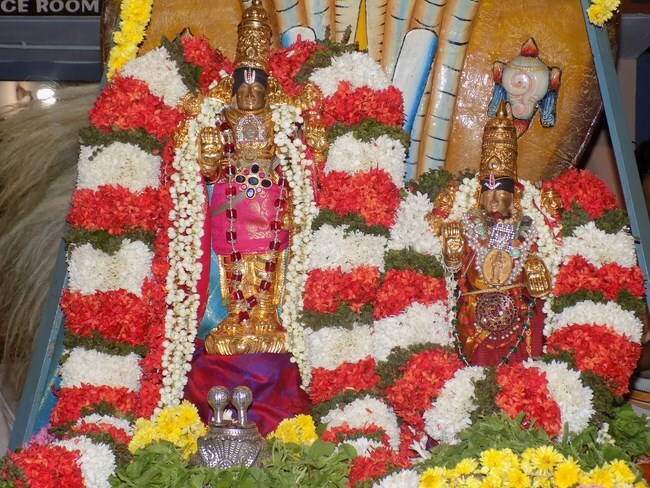 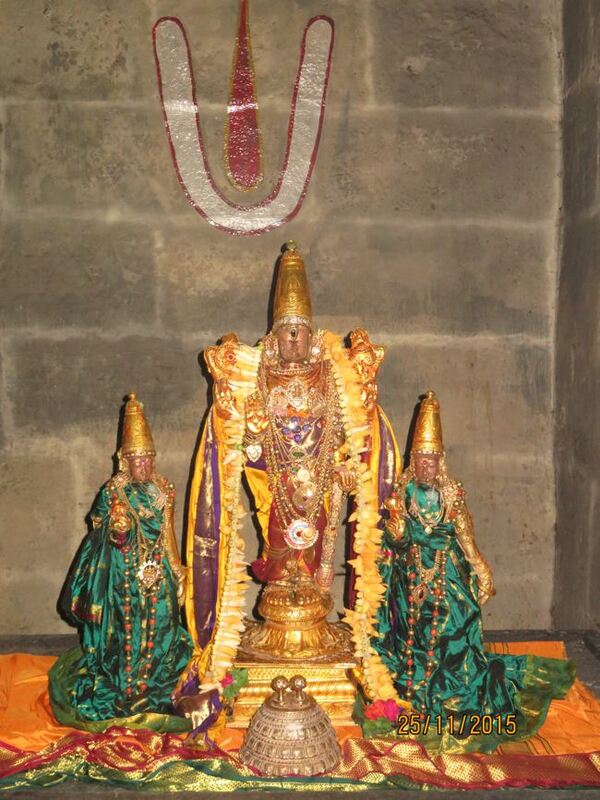 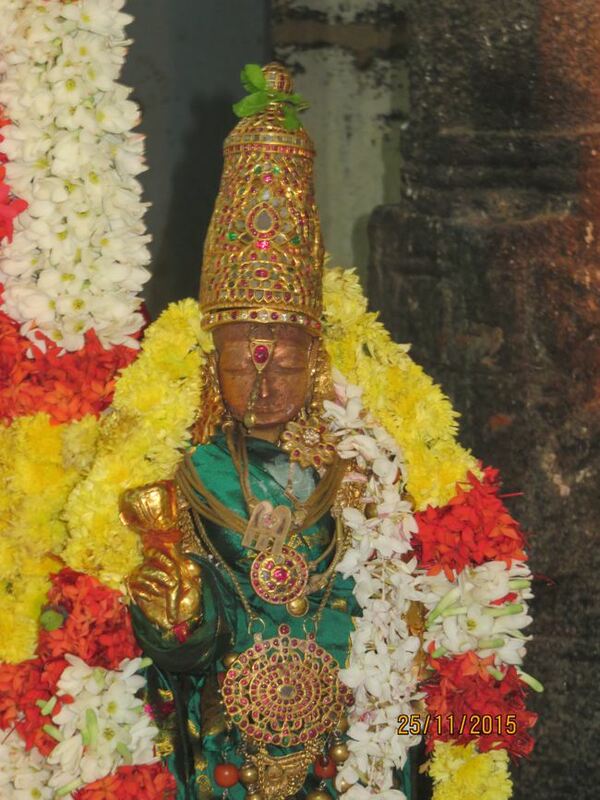 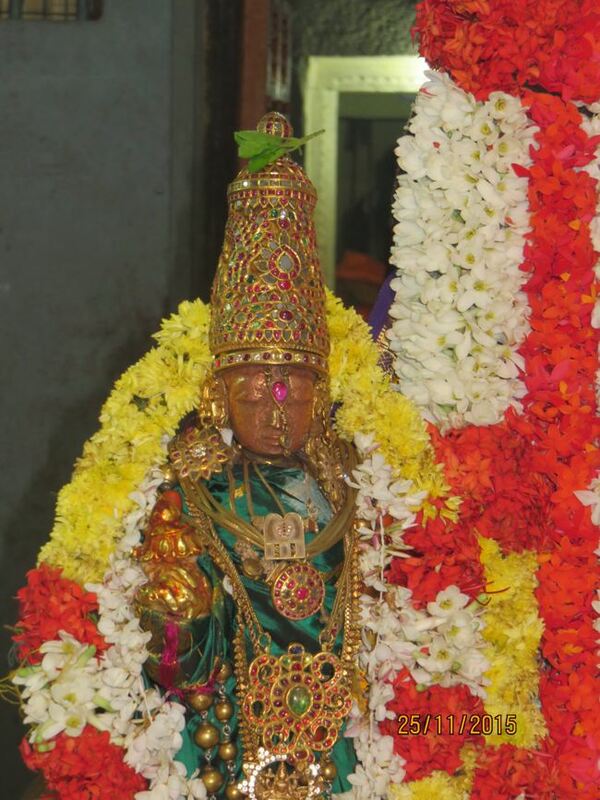 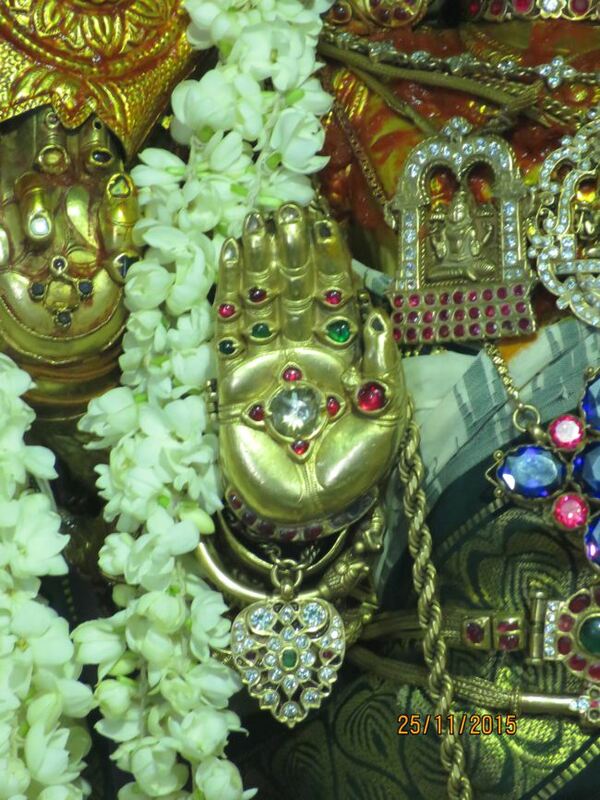 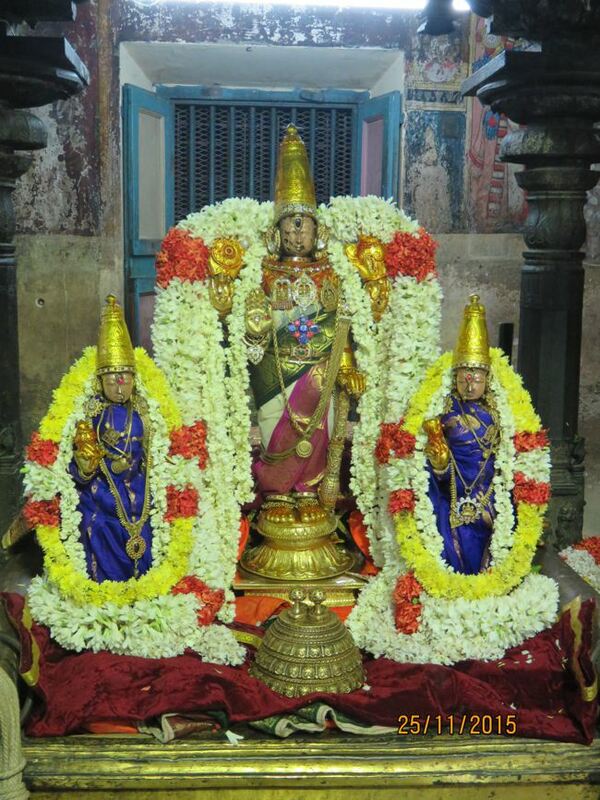 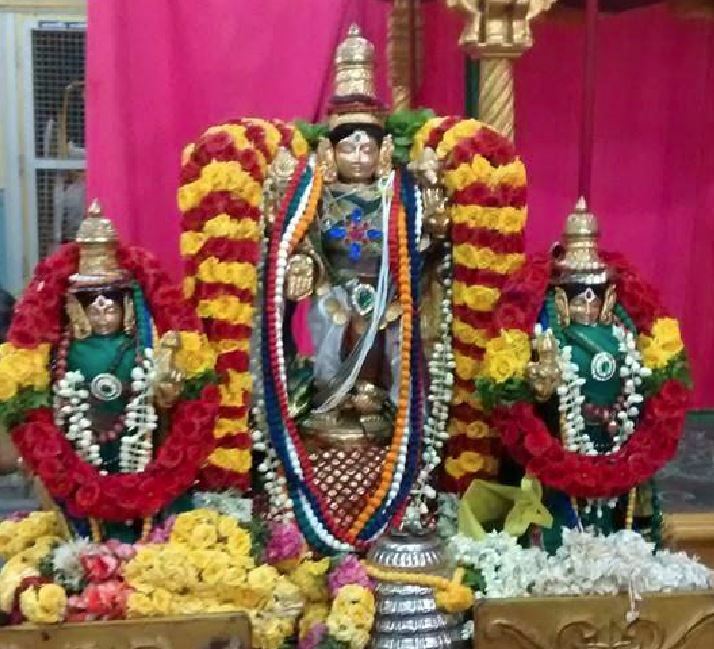 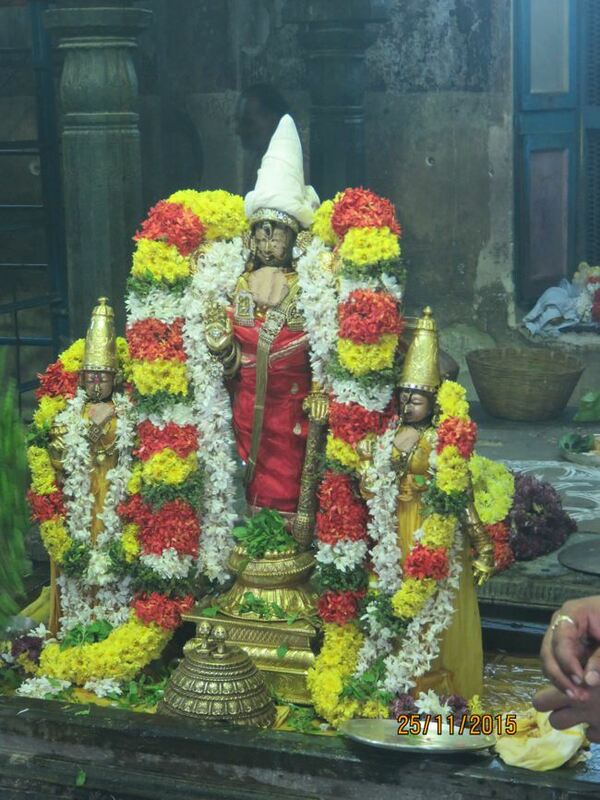 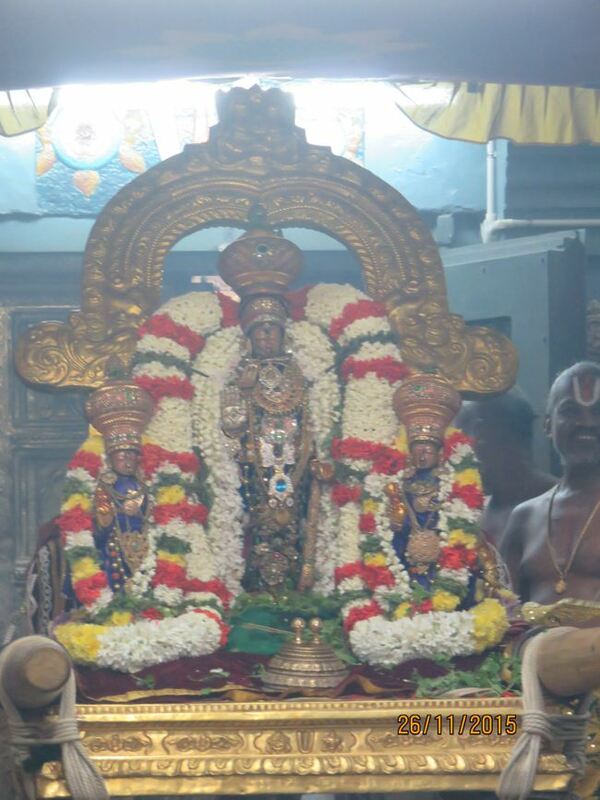 Perumal and His consorts looks so beautiful in all pictures (Thirumanjanam ,without flower,with flowers ,Azhwars too. 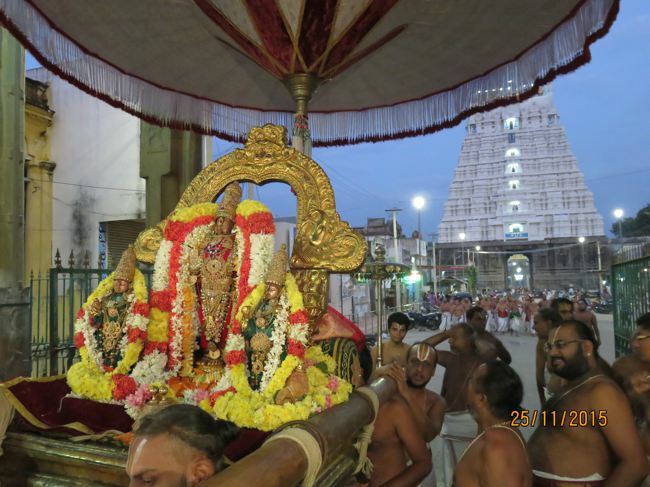 ))on both day Thirukarthigai Ustavam.Very well write-up and well covered photos .Thanks for sending. 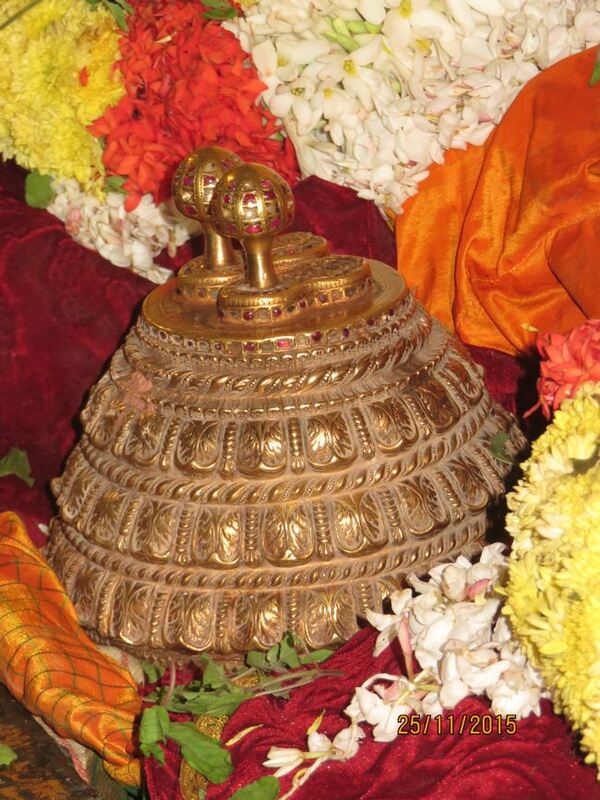 It is nice of you Smt. 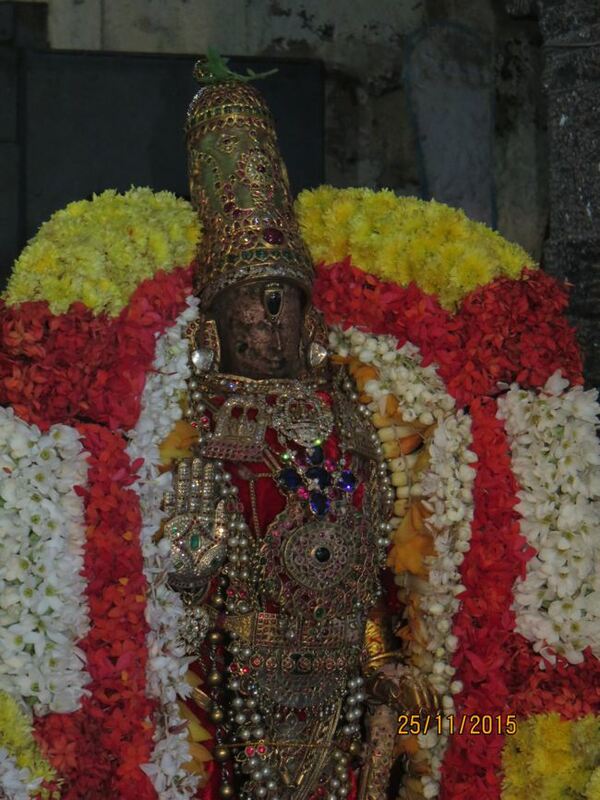 Prema Raghavan for taking time to post a feedback. 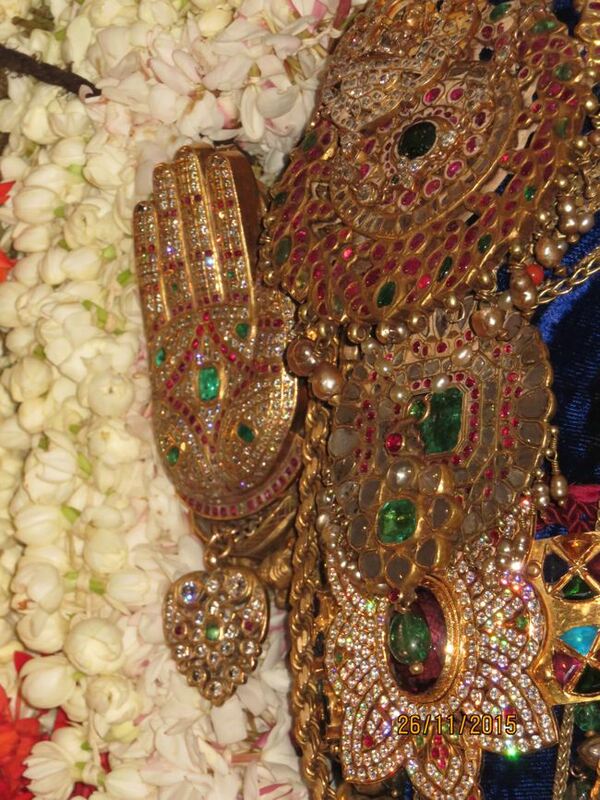 Thank you for the encouragement. 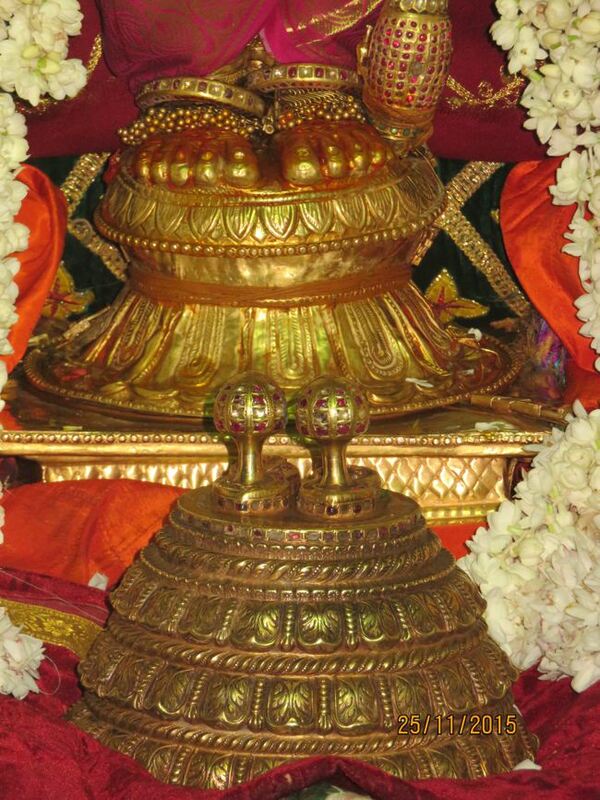 plz share me a divy photo of bardraj bhagwan in my face boook.